Capt. Amrit Singh is a Lead Shipping Analyst at Thomson Reuters - Supply Chain and Commodities Research team in London. He has over 30 years of shipping industry experience gained in various roles. Singh began his career at sea and ascended to become Captain with Wilh. Wilhelmsen, Norway before stepping ashore. Prior to joining Thomson Reuters, he was a Senior Equity Analyst at Clarkson Capital Markets in London with coverage of listed Shipping, Oil Services and Transport (Airlines & Automobile) companies across the U.K., Europe, South Africa and Asia. Previously, he has held position as General Manager of a shipping agency and has served as Head of Corporate Planning in a shipping company. 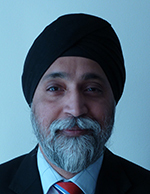 Singh holds a Master of Business Administration degree from the University of Edinburgh Business School, UK. Besides a Diploma in Ship Management from NSTC at North West Kent College, UK, he also qualified as a lead auditor/auditor in Quality and Environmental Management Systems.